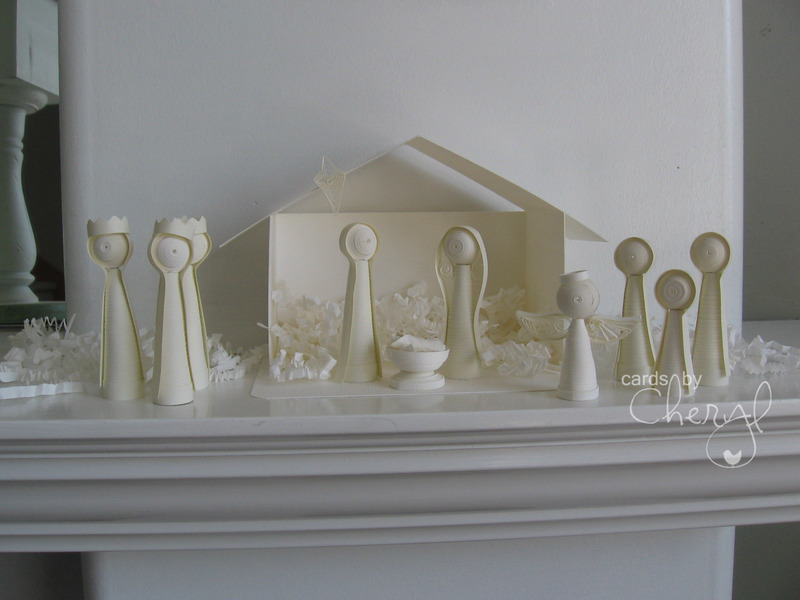 The simple elegance of this all-white quilled nativity scene caught my eye. Cheryl Scanks of A Paper Life in Vancouver, British Columbia is the designer. Cheryl told me she learned to quill in 2002 with the toothpick/puddle of glue method via a class at a scrapbooking store. Her love of quilling took off from that moment... she enjoyed practicing and was inspired by helpful sites such as a Yahoo quillers group. For the past few years, Cheryl has made a similar nativity using colored papers, but the all-white version is new this season in her Etsy shop, Cards By Cheryl. She's also in the midst of creating sweet animals to join the manger scene. You can follow along on her blog. About five years ago Cheryl tried 3-D quilling and found it was her favorite technique. "I love to tell stories though my crafts and 3-D quilling lends itself to that nicely." 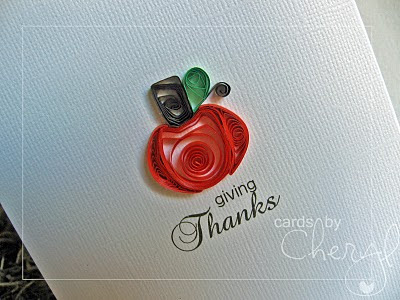 Of course with a shop name like Cards By Cheryl, you can be sure she designs greeting cards too. Quilled in her signature style, they are simple and modern. Cheryl works at The Essential Packaging Store in Surrey, BC which must be a dream job for someone who loves paper. She makes quite a few of the display samples, especially invitations, for the store and website. 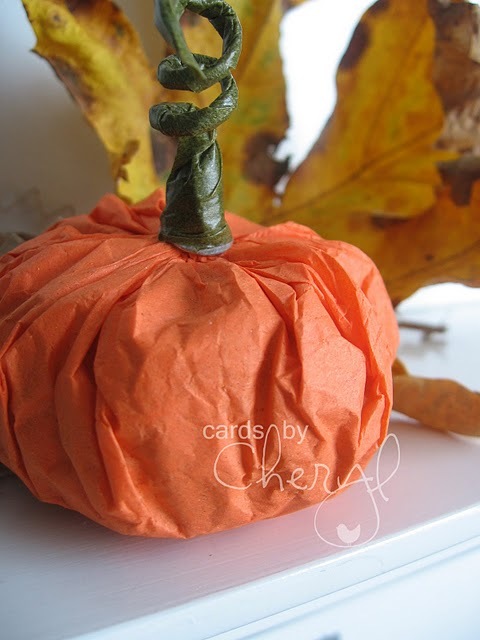 Recently Cheryl shared a tutorial for these cute tissue paper pumpkin favors on The Essential Packaging Store blog. By the way, Happy Thanksgiving today to all of you in Canada! I get very purist when it comes to nativity sets - I own a beautiful and plain, handmade one from the 1950s - but this gets my seal of approval. Very nicely done. I would get one of those. I collect miniature nativities. I don't have one in paper. This one is unique. I'm going to visit the Etsy shop. Thank you. I LOVE this Nativity. What a talent. I'll be visiting the on-line store to see all your designs. How amazing! I especially love that sheep. I love Cheryl's blog and her nativity is awesome. Thank you everyone for all of the wonderful comments. They are all greatly appreciated. What a beautiful feature - we're fortunate to see Cheryl's talents first hand and are always amazed what she comes up with! Congrats , Cheryl! ohhh cuuute!! 3-D quilling?? so amazing. i love love love the sheep, it is adorable times ten. Her quilled white nativity is so unique ,her cards are cute too. I love the little sheep! I need to get some of those for my friend. Thanks again everyone for all of your comments. For those of you asking, I hope to put the quilled sheep, donkey and camel on my etsy site over the next week or so. I will be selling them as a trio add-on for the nativity. If you want me to let you know when they are ready just send me an email. Thanks again to Ann for the profile of my quilling. I am truly amazed at the feedback. The all white 3-D work is fantastic, but I really love that pumpkin. Amazing. Thanks, Ann. I love the monochrome navitity set, I love the stylised figures, they are very sweet, what a fantastic 3d piece. great !!!!! liked it !